I have started a new project investigating the influence of myth and myth-makers on national character and identity. JM Synge is considered one of Ireland's greatest writers, he was interested in the essence of Irishness, not a nationalist but utterly determined to understand Irish identity through his work. 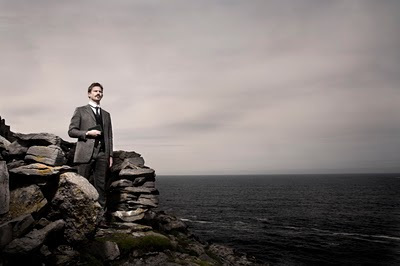 We shot the first image at Synge’s chair, on the edge of Inis Meain, one of the Aran islands, where he gathered the thoughts and ideas that fuelled his masterworks. The second one was taken in front of the house he resided at while on the island. Unfortunately I didn't have enough time to grow a moustache so I had to fashion a fake one using my own hair. 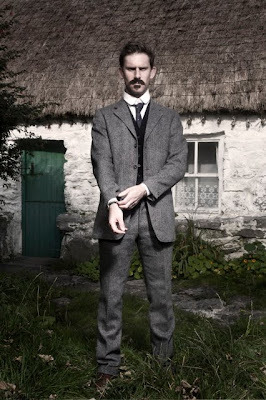 I sourced the suit at the Costume Mill in Dublin. TG4, the Irish language TV station, filmed the shoot and broadcasted it on 'Imeall', their arts and culture show. I have always had an affection for the statue of Cuchulainn in the window of the GPO in Dublin. 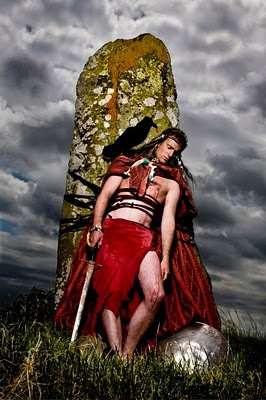 Cuchulainn is the most widely known figure from Irish mythology. In the Tain he is mortally wounded, he hauls himself onto a rock and dies facing his enemies. A raven lands on his shoulder which signals his death. In June 2008 I set out to recreate this image at the actual location of his death in a field outside Knockbridge in Co Louth.